"There’s passion and romance, life and death, suspense and lust, all told with an underlying sense of foreboding and hope, which the author applies at just the right measure. 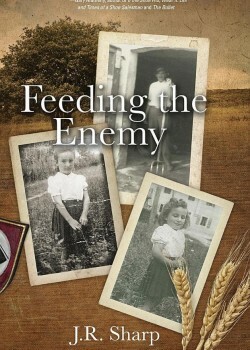 Feeding the Enemy is a well written and inspiring novel that’s not only heartfelt, but also sophisticated and thought provoking in the best tradition of the greatest historical novels. Well done!" The Columbia Review. For readers who love the great novels of the Second World War and yearns for another deep and thoughtful story told against that great human drama, Feeding the Enemy by J.R. Sharp will be highly satisfying, providing both laughter and tears. The author managed to utilize a broad canvas to tell a very personal story for a unique cast of characters, centering on an Italian family caught in the fire of the fascists’ war. Protagonists are led by Pietro Zucchet, a veteran of the First World War and the family patriarch, who is engaged in his own war here—a war for the survival of his family members, which he fights with ingenuity and verve. His daughter, Catherina, is perhaps the novel’s emotional linchpin, as we journey with her from youth and charming naivety through marriage and motherhood, all the while fighting alongside Pietro for survival and, not less important, dignity. Gino, her love, gives us a front-row seat to what Italian soldiers of that time experienced, both in battle and back home. J.R. Sharp tells us this grand story with multiple layers of depth, enriched by an original setting and creative circumstances, which together make for a spellbinding novel. Based on a true story, the novel is thick with the texture of real life. Events unfold naturally to create conflicts and interactions between the characters and a world caught in turmoil and bloodshed. There’s passion and romance, life and death, suspense and lust, all told with an underlying sense of foreboding and hope, which the author applies at just the right measure. Feeding the Enemy is a well written and inspiring novel that’s not only heartfelt, but also sophisticated and thought provoking in the best tradition of the greatest historical novels. Well done!